The Bears went from one win to a bowl win in Matt Rhule's second year in Waco. 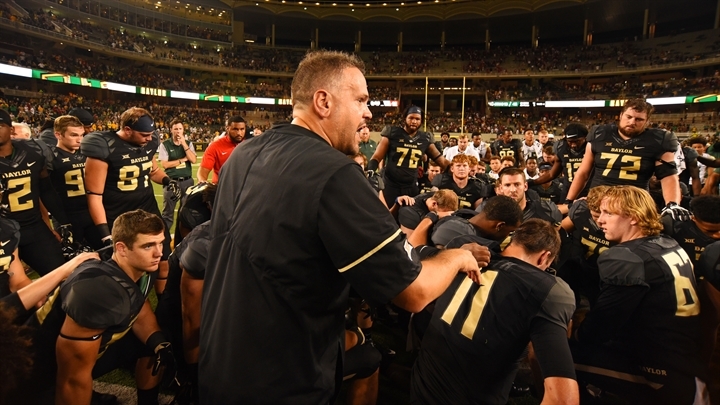 Baylor football fell to rock bottom in 2017 after finishing just 1-11 in Matt Rhule’s first season. But just like at Temple, Rhule has already started the rebuild in year two. The Bears miraculously found a way to win critical games down the stretch and earn their first bowl trip since 2016. Rhule was hired to tear down the program and build from the ashes, but few expected that the turnaround could come so quickly. Here’s our full postmortem and review of the 2018 Baylor Bears football season. It took a little while for Brewer to convincingly win the starting job. Once he did, the sophomore from Lake Travis put forth a strong season. Brewer threw for more than 3,000 yards, 19 touchdowns and nine interceptions despite missing time with injuries. In his final two games of the year, Brewer combined to complete 67 percent of his passes for 692 passing yards, five touchdowns, two interceptions and two rushing scores. Brewer played a critical role in all seven of Baylor’s wins. Baylor needed someone to step up and become a disruptive presence on the defensive line. True sophomore James Lynch was happy to oblige. The Round Rock product led the team with nine tackles for loss and 5.5 sacks in a breakout second season. Even when he didn’t get all the way to the quarterback, Lynch was a disruptive force that helped create opportunities for other defenders. 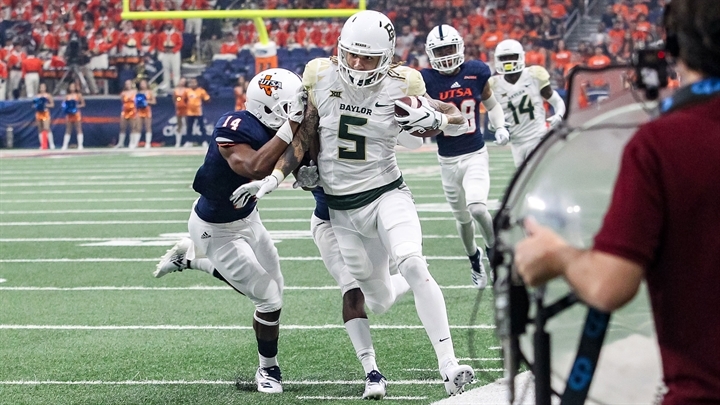 When Jalen Hurd transferred from Tennessee to Baylor, there was hope that he could eventually be a contributor. Rhule complimented him during his redshirt year, but there was always going to be a learning curve after changing from running back to wide receiver. Almost from day one, Hurd proved he could be a standout Big 12 receiver. The senior caught 69 passes for 946 yards and four touchdowns in his lone season as a Bear. Hurd added 209 rushing yards and three touchdowns as a short down running back. Hurd filled a multitude of roles for a Baylor team that had big holes. His veteran presence was critical to helping the Bears make an unexpected bowl game. When Baylor lost to Duke early in the year, it seemed to spell the end to the Bears’ bowl hopes. Baylor was favored to beat Kansas, and a matchup with Kansas State looked manageable. But after that, finding two more wins seemed unlikely. But in the penultimate week of the season, Texas Tech started crumbling. The Red Raiders lost by a large margin against Kansas State. Baylor still needed one more win after beating Kansas State and Oklahoma State at the last second of exciting games. Texas Tech seemed like an opportunity. It was a back-and-forth game in the first half, but the Bears came out in the second half ready to make a bowl game. Brewer and John Lovett each ran for touchdowns in the third quarter and gave the Bears a double-digit lead they would never surrender. After losing against Liberty and UTSA in the first games of the Matt Rhule era, making a bowl game once again was a rush. Here’s Baylor’s first half drive chart in its game against West Virginia: punt, interception, interception, punt, punt, punt, interception, punt, punt. To say the least, it was a nightmarish night in Morgantown. By the end of the game, people questioned whether Brewer suffered any injuries. The sophomore completed 1-of-8 passes for 22 yards and three interceptions before getting yanked. It was easily the worst game of his career, perhaps at any level. After that game, the 4-4 Bears felt further away from a bowl game than ever. It was a demoralizing performance, both on and off the field. With Oklahoma State, Iowa State, TCU and Texas Tech coming up, it was almost time to count the Bears out. Biggest offseason question: Can Baylor take another step forward in 2019? Baylor made as many steps as could be expected during Matt Rhule’s second season. Rhule led Temple to 10 wins in just his third season. A jump like that is unlikely at the Power Five level, but more improvements are an expectation. The Bears rank No. 20 in returning production per SB Nation, and No. 7 at the Power Five level. The level of returning defensive production ranks No. 7. With the offense finally coming together down the stretch, the upperclassman-heavy defense has to be next. However, things won’t be easy. The Bears lose wide receiver Jalen Hurd, a pair of offensive line mainstays, several key defensive linemen and three of their “single digit” honorees. Other players have to step up and lead. Rhule’s culture will really be put to the test, as the majority of the roster will have learned for multiple years under Rhule’s leadership. Baylor went 1-11 in 2017 and was picked No. 9 in the preseason poll, only ahead of Kansas. By any measure, the Bears had a tremendously successful year. It wasn’t all pretty. Rhule took his time giving the reins over to Brewer under center, which undoubtedly hurt his development. Losses against West Virginia and TCU left the fan base demoralized. Tackling issues still plagued the young defense. But still, Baylor is clearly trending in the right direction after Rhule’s scorched earth rebuild. As we mentioned, Rhule went from two to six to 10 wins in his first three seasons at Temple. With so much of the roster coming back, the Bears should have big expectations in 2019 – and for good reason.